Unnecessarily Gendered Vegan Food - Corey Lee Wrenn, Ph.D.
“Organic Girl Good Clean Greens,” because only women eat organic? Perhaps because it challenges a controlling and hierarchical relationship with the environment, organic consumption and food products are often feminized. Men dominate the environment, force it to comply, and destroy threats to this control. Women harmonize with nature instead. Men need their meat, and are willing to hurt others to get it. Women, however, just eat salads, not unlike the vulnerable herbivores men desire for their dinner. The emphasis on vulnerability is reinforced by referring to female consumers as “girls.” Infantalizing women with “girl” rhetoric is a common practice, one that disempowers women and reaffirms male dominance. Grown men are infrequently referred to as “boys,” with the important exception of African American men, who have historically been called “boys” by whites seeking to reinforce Black men’s relative powerlessness in a racial hierarchy. Feminizing food has the potential to reinforce inequality. The process links plant-based eating with marginalized social groups, and stereotypes women as weak. Ironically, while consuming animal flesh is a privileged act as it rests on human supremacy and control over other animals, eating green is privileged as well, despite its bad rap. Plant-based foods promote health and longevity, but they are sometimes difficult to obtain given poor food accessibility in many parts of society. 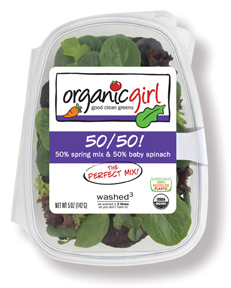 Eating “clean” and “green,” as this product champions, should be accessible to anyone, regardless of gender. Why does food gendering happen? As with any product for sale, considerable resources are invested in its marketing. Nothing happens by accident in this process. Advertisers are aware that gendering products can increase the number of products a household must purchase (this item is for her, that item is for him), and the amount paid (products advertised for her tend to be marked up in price). Food and gender is “the perfect mix” for profit-minded corporations. This essay was originally published on The Academic Activist Vegan on March 8, 2013. Readers can learn more about the intersections of veganism and gender in my 2016 publication, A Rational Approach to Animal Rights.